Christmas will come early for local families in need this week. 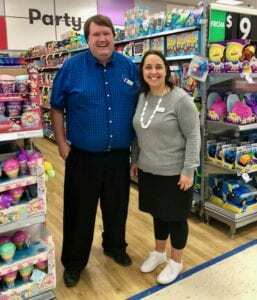 Karinya House, Canberra’s renowned home for mothers, babies and families in crisis will be gifted toys and baby items as part of BIG W’s partnership with Good360. BIG W and Good360 teamed up last Christmas to deliver more than 400,000 new, excess-stock items to various charities across Australia. This year BIG W are again committed to making a real difference to families in need and charities will be able to pick up donations of brand new goods direct from their local BIG W store. Good360 partners with businesses like BIG W, who donate end-of-line or over-stocked goods which would otherwise be discounted below cost, sent overseas, or end up in a landfill. Good360 then offers those goods free of charge (other than a nominal shipping and handling cost) to its network of more than 800 charitable organisations Australia-wide, who then rapidly distribute the goods to Australians in need. The Snow Foundation provides vital funding to assist Good360 and is a long-term supporter of Karinya House’s vital community programs that assist families in need, 24 hours a day, seven days a week. Karinya House offers a safe and secure environment to women in the ACT before and after the birth of their child. It may be the only source of support they have during that critical time.